The U.S. debate over Confederate statues will look familiar to a lot of nations. The United States is once again grappling with what to do about public symbols of the Confederacy as they become rallying points for white supremacists. Although the debate over Confederate statues is uniquely American, the broader question of how a nation should memorialize painful or divisive parts of its past is an issue that numerous countries still struggle to address. Some have chosen to outright remove monuments or notorious buildings, while others have recontextualized them or built new ones in their place. Whatever the outcome, the process is often contentious. “Most countries have been pretty reluctant or just don’t know how to commemorate periods of shame or national crimes perpetrated in the national name. No country is very good at it, and we haven’t been very good at it, either,” said James E. Young, a professor emeritus at the University of Massachusetts Amherst who has consulted for governments on how to memorialize their pasts. In Europe, many post-Soviet states have chosen to take down the statues of Josef Stalin and Vladimir Lenin that dotted their cities under communist rule. Ukraine, for instance, has removed over a thousand Lenin statues following the ouster of its pro-Russia president in 2014. But some former communist states have instead decided to move their Soviet-era monuments somewhere else or alter them to connote new meaning. Hungary keeps many of its communist-era statues in a memorial park, a move Taiwan also favored for statues of its former leader Chiang Kai-shek. In other cases, citizens have taken it upon themselves to respond. 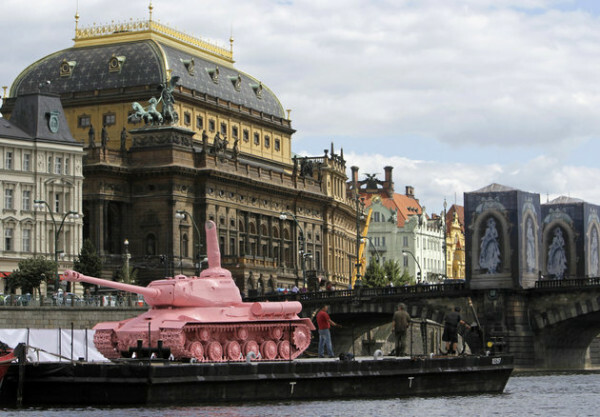 In 1991, a young Czech artist in Prague painted a Soviet World War II-era tank monument entirely pink. The artist was arrested for vandalism, but members of Parliament repainted the tank to protest his detention. A pink Soviet World War II-era tank on display in front of the National Theatre in Prague on June 20, 2011, marking the 20th anniversary of Soviet troops’ withdrawal from Czechoslovakia. In countries like Italy and Spain, where brick-and-mortar remnants of fascist rule are still standing, architectural works and even human remains have been a source of debate. Spanish Parliament passed a nonbinding vote in May urging the removal of former dictator Francisco Franco’s body from a public tomb ― something that has yet to occur. France, meanwhile, bans any monument to its Nazi-collaborating Vichy government, and as of 2013, every street name featuring Vichy leader Philippe Pétain had been changed. Nowhere in Europe, however, has had to confront its past crimes on the same scale as Germany. The country’s reckoning for World War II and the Holocaust has led to the preservation of some sites, such as Auschwitz, while most other symbols of Nazi rule were systematically destroyed or banned. It is currently illegal for Germans to display any symbols associated with Nazism or Adolf Hitler, with a few exceptions for artistic purposes. Holocaust denial, too, is a prosecutable offense. Along with the removal of monuments to the Third Reich, Germany has also built memorials and museums that commemorate the victims of Nazism. Seeking to counteract the grandiose monuments the Nazis built, some of the memorials have taken on more experimental forms. Germany has also created federally funded projects to atone for its past. In the mid-1990s, the country held competitions to design a memorial for the 6 million Jewish people killed by the Nazis. It sparked a fierce debate as artists and politicians argued over how it was possible to properly memorialize the Holocaust. One of the artist submissions for the Memorial to the Murdered Jews of Europe even proposed that Germany destroy Berlin’s famous Brandenburg Gate and sprinkle the dust over the monument site, then cover the area with granite plates. The concept aimed to memorialize the void left by the Holocaust with another absence. The design ultimately chosen, created by architect Peter Eisenman, opened in 2005 and features thousands of concrete, tomb-like slabs rising from the ground on an uneven plane. Meanwhile, across Canada, there are small monuments that focus on healing and understanding of “Canada’s Holocaust,” which ripped 150,000 indigenous children from their families and placed them in residential schools under the guise of education. The policy ― which the U.S. also pursued ― began in the 19th century and continued in some form until the last school was finally closed in 1996. The children died from malnutrition and other horrific conditions, and generations were traumatized by the institutions’ legacy of sexual and physical abuse. Recent Canadian initiatives have focused less on building memorials and more on removing monuments or tributes to notorious or polarizing historic figures. In June, Prime Minister Justin Trudeau renamed the Langevin Block, which houses his office. The building’s namesake was Sir Hector-Louis Langevin, one of the architects of the residential school system. The city of Calgary also renamed the Langevin Bridge this year. 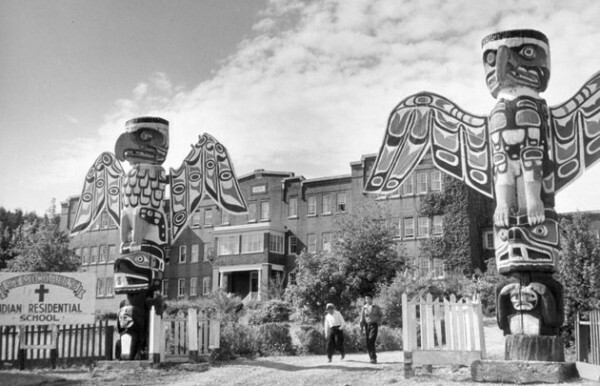 Students walk between two totem poles at St. Michael’s Indian Residential School in Alert Bay, British Columbia, in a 1970 photo. In Mexico, sites honoring controversial figures from the country’s past have also become targets for removal or public ire. In 1981, President José López Portillo installed a statue of Spanish conquistador Hernán Cortés, who carries a brutal colonial legacy, in Mexico City. It lasted a year before the subsequent presidential administration took it down. A statue of Mexico’s former dictator Porfirio Díaz, unveiled in 2015, also drew protests, with demonstrators at the ceremony chanting that it would come down. It is still currently standing. Mexico has also built monuments for its national tragedies. One such site is a memorial in Mexico City for the hundreds of student demonstrators killed by government forces during the Tlatelolco Massacre in 1968, when police and armed forces opened fire on the crowd. Another, unofficial, monument stands on Mexico City’s Paseo de la Reforma to honor the 43 missing student activists who are presumed dead after they disappeared following an attack by police in 2014. 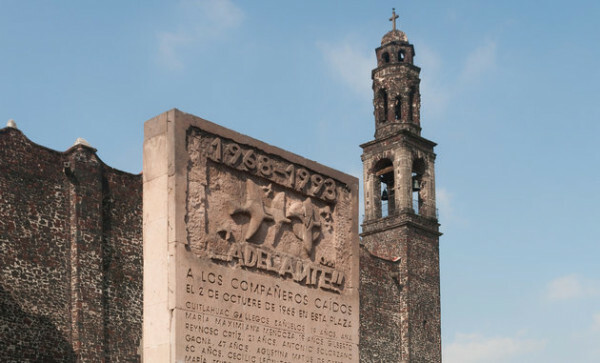 A memorial to the 1968 Tlatelolco Massacre stands in Mexico City. One of the closest and most recent analogues for the U.S. push to remove Confederate statues took place in South Africa, where a student movement rose up against memorials to historical figures who promoted forced racial segregation. A groundswell of resistance to colonial and apartheid-era monuments began in 2015, when a student at the University of Cape Town flung a bucket of excrement on a prominent statue of Cecil John Rhodes, a 19th-century imperialist who paved the way for the country’s apartheid system. South Africa’s student movement against Rhodes and other colonial figures grew in size and spread to other campuses. The demonstrations eventually prompted the university to remove the Rhodes statue and forced the government to propose a plan to create “common parks” that situated the statues in a context that discussed the country’s history. South Africa’s Arts and Culture Department told HuffPost South Africa on Friday that it would comment in early September on that project’s progress. 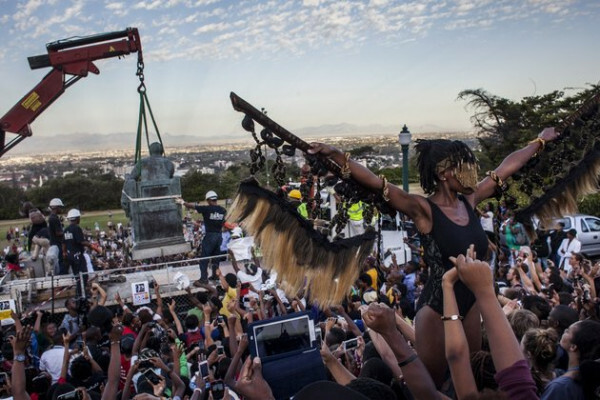 Students cheer as the Cecil Rhodes statue is removed from the University of Cape Town on April 9, 2015, in Cape Town, South Africa. The different approaches to memorializing atrocities and painful national histories show that the U.S. could address its Confederate monuments in various ways. But it’s possible the country will remain stuck in this debate for some time. So far, action on Confederate statues and other controversial memorials has been piecemeal and conducted mainly at the local level, given the huge obstacles to a systematic and coherent national process of dealing with them. President Donald Trump has repeatedly opposed the removal of statues and used the issue to rile up his base. Trump has lamented the “history and culture of our great country being ripped apart” as Confederate statues come down. He reiterated his opposition to their removal during a campaign-style rally in Phoenix on Tuesday. Polls show that the public is also split over what to do with the statues, with a majority wanting the figures to remain in place. But the continuous rise and fall of memorials across the world also shows that regardless of their history, monuments are not as permanent as they may seem. “Monuments are never really perpetual or built for perpetuity, they’re built to last as long as the generation that built them,” Young said. Andree Lau contributed to this report from HuffPost Canada, Marc Davies contributed from HuffPost South Africa, Alexandre Boudet contributed from Le Huffington Post, Sebastian Christ contributed from HuffPost Germany, Alejandro Angeles contributed from HuffPost Mexico.